Those of you following my posts are acquainted with Francene Stanley, an up and coming writer who first came to my notice when she and Edith Parzefall co-authored several novels in the Higher Ground Series at Double Dragon Publishing. Included in their novels were Knights in Dark Leather, Golden Submarine, and Long Doom Calling. "With other commitments, my partner Edith didn't have time to write another book with me, but I was eager to continue so I took on the task, and she offered suggestions and encouragement. And so, Seaweed Ribbons grew into a separate novel. "In the plot of the futuristic Higher Ground series that Edith Parzefall and I wrote together, one character stays behind in a matriarchal society while the adventurers in the main story continue with their quest. "Raymond is not perfect, by any means. I based his character on my first husband—physically strong and determined, but self-centered and inclined to doubt himself at times. I wondered if he would change, given a new love to raise him from his depths of hidden uncertainty. His companions witness the wedding before they leave on the next stage of their journey. Ginny, a young woman who is an outcast in her group, is mainly kept on to do the work. Her hidden strengths bind them together, despite his insistence on taking the lead. "My novel, Seaweed Ribbons, which went through the novels on Internet Writing Workshop last year, has been published at last by Double Dragon Publishing. Deron hung onto the manuscript for a year. I was just about to give up. "I had no input into the cover and I hate it. However, I'm proud of the writing, and we shouldn't judge a book by its cover--especially an e-book, where the picture hardly matters. I have no plans to print it as yet. "However, with the critiques, support and encouragement from other writers at IWW, I improved the story and polished the writing toward its peak." Francene found initial inspiration in poetry and songwriting but later turned to writing novels. Like her main characters, she expresses optimism, determination to succeed, and strives to illustrate the principle of positive thinking combined with the trust that things will work out. Born in South Australia, she married young. Retreating to the small fishing village of Robe, she ran a craft shop and tea room, welcoming tourists to the area. In the early nineteen seventies, her husband and she took a year off with three children on a trip around Australia in a caravan looking at various ways of alternative living before resettling in Robe. After her divorce, she left Australia and moved to England, where she worked as a nanny, travelling around the world with the family she worked for. Francene met her present husband in London and worked in the catering business for 12 years interspersed with trips to far distant lands. Read Francene's Daily blog here. 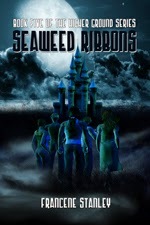 Seaweed Ribbons is also available at Amazon. Are you a Kindle author? Check out all your book sales data on your Android with the Afterword app. NOTE: Afterword and its development team are in no way affiliated with Amazon.com.